this weekend saw Elvis get a 1st in Limit under breed specialist and keen musher, Lindsey Sutherland. we all got a tad excited in the challenge as the judge carefully compared Elvis with his father, Kaliznic. as you can see, he was looking rather good chasing his dad around the ring. there are some more photos of him from this show on his page here. what a fabulous venue this show has. it was nice to be only a minute away form the car, without having to go through barriers etc. it was noted by a few, that the few periods of rain had little affect on the dogs that work in Winter. what’s a rain shower to an outdoor dog? many a rally is spent in the wet! I do agree with the judges decision to stay outdoors. the wet-weather ring was tiny and we would never had got the chance to see our boy move so well. after Kelso, we headed down for a sleepy night at the Metal Bridge hotel in Carlisle. on Sunday, Elvis was placed second to his brother, Fya in Open class, at the SHCGB Northern Open Show. the grass was a tad long and the terrain undulating in the dog ring. he went on to be thrown out of the working stakes class, which left me somewhat speechless, considering he was number 3 in the 2003/4 UK Dual Championship. to finish the day, our Jeep sprung a radiator leak just as we set off, which meant us travelling back to York with the car on the back of flatbed tow truck. suppose we saved on petrol? big thanks to Mark and Bette for providing coffee and cakes whilst we waited for the AA to turn up to diagnose that we needed a tow home. it was only 12 months ago that the radiator on the mr2 sprung a leak on the way home from Blackpool on a queuing motorway – which then saw a line of husky people pulling over with offers of help. Anthony Rees gave us a bottle of water for Elvis cos this extra wait had not been part of our plan. we have some great friends in the Husky Club. 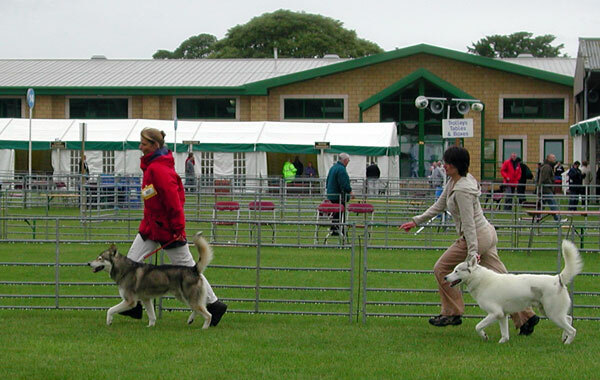 This entry was posted in Showing Huskies and tagged Carlisle, flatbed, Kaliznic, Kelso on June 21, 2004 by Guy Redwood.